The exam room and hospital bedside are usually non-partisan zones. Though there have been exceptions--anti-nuclear activists Dr. Benjamin Spock and Dr. Bernard Lown come to mind--physicians tend not to be particularly political people. And even when they are, their politics don't usually intersect with their clinical work. 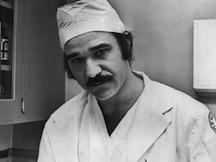 When President Reagan was shot and joked with surgeons, "I hope you're all Republicans," the response from one doctor (a Democrat) was: "Today Mr. President, we're all Republicans." But sometimes doctors find themselves, or thrust themselves, into the middle of political conflict--such was the case of Dr. Kenneth C. Edelin, who died this week at 74. In 1973, soon after the Supreme Court decision in Roe v. Wade legalized abortion in the U.S., Edelin became a key figure in the women's reproductive rights movement. As an OB-GYN resident at Boston City Hospital, Edelin performed an abortion on a 17 year old in the second trimester of her pregnancy. Though the abortion was legal, Edelin was convicted of manslaughter. The conviction was overturned by the Massachusetts Supreme Judicial Court. The case became a focal point for arguments about when life begins--an argument still ongoing. The fact that Edelin was African-American, during a time of great racial tension in Boston, was felt by many to be a factor in his initial conviction. Also, ten of the twelve jurors in the case were Catholic. Edelin later wrote: "In Boston, it was the perfect storm. It was the religious climate; it was the racial climate. [Boston] had always been a cauldron when it came to women's rights. It was the right place and the right time for those who wanted to make a statement. It was the wrong place and the wrong time for me." Still, Edelin's involvement in the landmark case (like Rosa Parks' in hers) was not random. He'd lost his mother to breast cancer when he was a boy and had witnessed the death of a teenager after a botched illegal abortion when he was in medical school. By 1973 he had already decided to devote his career to the health of women--particularly poor women of color. He maintained that commitment throughout his career, especially through his work with Planned Parenthood. Edelin paid a price for his role in the 1973 case. He lived for years with anger about his conviction and, though he became a hero to many, he was a villain to many others because of the association of his name with abortion. His legacy, however, transcends that issue. For physicians daily confronted with evidence of inequity in access to health care, threats to women's reproductive rights (including, just this week, ongoing debate about coverage of birth control mandated by the Affordable Care Act), and the effects on our patients' health of food and environmental policies, the name "Kenneth C. Edelin" is a reminder that medicine and politics are not as separable as we so often believe.